This is both a powerful and dangerous section of your administrative area. It provides you with both the ability to increase the capabilities of your website, as well as to completely remove all customization I’ve done to it. Proceed with caution, particularly where indicated below. This is basic functionality in WordPress, allowing you to configure the look and feel of the front end of your website. However, you have specifically paid me to create a custom design and coding for your site, and I have already set this up as is appropriate. Changing anything in the Themes area will completely change the front end of your site’s look. You should never change anything in this section. Doing so could incur significant additional charges for me to set everything up again. 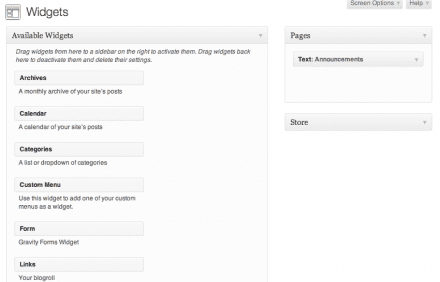 The boxes on the right represent different sections of your site that widgets can be added to. In the example shown above, there are two sections: Pages and Store. These would be represented by different areas of your site’s front end, and will be explained in more detail in your How To Beta document, as they are unique for each client. The Available Widgets can be dragged and dropped into one of the boxes on the right, placing it in that space on the front end as well. There are a ton of widgets available right out of the box, and you can browse or search WordPress’ Plugin Repository1 for new ones. Once you drag a widget into the appropriate box, you can click the arrow to the right of it’s name to see what configuration details it provides. Click Save to save your changes and you’re all good to go. Theme Locations. If your site has more than one configurable navigation menu, you will be able to configure them all here. However, when I set your site up, I already setup this Theme Locations box. Changing the contents here can break your site on the front end. Custom Links. If you want to add a custom link to your navigation, enter the URL here. Note about URLS: There are two types of URLS, absolute and relative. An absolute URL is something like http://google.com or http://clicknathan.com/contact, it’s the full address of the page, including the http:// part. When adding a link to another site, it’s necessary to use absolute URLs. A relative URL is something like /contact and it’s called relative because it will be relative to the page that the user is on when they click a link. So if they were at http://clicknathan.com/web-design and they clicked a relative URL of /contact, they would be taken to http://clicknathan.com/contact. If you just added in the relative URL as contact without any slashes, they they would be taken to http://clicknathan.com/web-design/contact, moving forward one folder (if it exists of course). This custom links section is really only necessary if you want to point someone to a location that isn’t on your own website. If you’re linking to a page or other content on your own site, use one of the following sections. Pages. You can put a check mark next to any page you’d like to add to the navigation, and then click Add to Menu to move it to the right hand column (where the navigation menu structure is displayed). Posts, Categories, and others. Depending on your site’s setup, you may have additional sections that allow you to add links to those types of content. It is not recommended to use these in most situations, as you may link to something that wasn’t intended to be viewed on it’s own. Navigation Structure. On the right hand side you’ll see the current navigation structure of your site. You can drag and drop items to reorder them, and move them slightly to the right to indent them. An indented item will appear as a dropdown navigational item, as opposed to the main navigation. Feel free to play around with the navigation structure, save the changes, and view it on the front end of your site. Note that space limitations with your site’s design will determine how many navigation items you can have. This gives you access to editing many of your website’s files. This goes without saying, but I’ll write it anyway: if you don’t know what you’re doing, you shouldn’t be editing the HTML, CSS and PHP files on your site. Doing so will incur additional fees, sometimes significant in amount, if I need to go back in and fix things. 1Widgets and Plugins (hereafter referred to simply as “plugins”) are often easy to install and work right out of the box. However, you should note that a) plugins are created by 3rd party developers, meaning not ClickNathan and not necessarily WordPress, b) plugins often work by simply installing them, however some plugins require various amounts of setup, including design, development or editing settings within WordPress, c) I charge extra for any plugin customization needed, and d) except where I have installed a plugin or have indicated thusly in the contract, I do not provide or imply any type of warranty or guarantee that plugins will work correctly, or even that they won’t break your site, contain malicious code, or any other undesirable results.